After presiding over the inception of America’s Great Depression, Hoover believed that he had the country back on the right track only to be ousted by an ungrateful electorate in 1932. He believed that the incoming Roosevelt administration, with its announced economic and social reforms, would derail the train whose course he had, with much effort, corrected and would turn the United States toward communism. Ever the calculating politician, he wrote the incoming president a lengthy letter urging him to renounce his “so-called new deal,” knowing Roosevelt would refuse, but thus setting himself up to be the country’s savior. 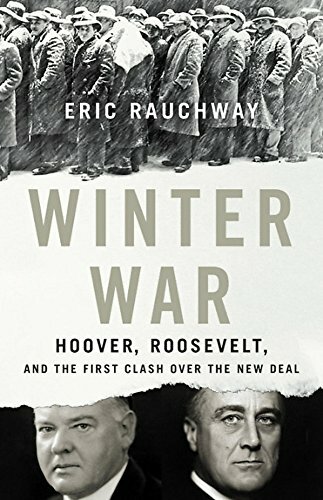 Winter War details, almost painfully, not only how badly Hoover miscalculated but also how he set the stage for future philosophical battle lines between Democrats and Republicans, as reflected by the platforms of notables such as Barry Goldwater and Richard Nixon. “Hooverism became central to Republicanism,” Rauchway says, driving home this point. Winter War lifts the curtain for a behind-the-scenes peek at how presidential campaigns often reflect personal grudges that either motivate or taint the respective candidates. In a sense, it reveals that even presidents can sometimes be nothing more than aging children carrying adolescent chips on their shoulders. For his part, Roosevelt, who, rightly or wrongly, comes across as the story’s hero, dodged Hoover’s booby-traps on issues of social justice, women’s rights, prohibition, and bank failures while simultaneously dealing with new threats on the horizon abroad, such as the rise of Nazism and Japanese aggression. While Hoover concentrated on undermining his successor, Roosevelt chose to think of the country instead of a vanquished opponent. The results speak for themselves. Presidential transitions are often anything but smooth, particularly when accompanied by lame duck sessions of congress. Outgoing presidents and their allies try to cement their legacies and, often, evade responsibility for their failures by kicking those particular cans on down the road to the next administration. For their part, incoming presidents must juggle learning a new job while simultaneously strategizing to carry out their agendas, all while evading landmines left by their predecessors. History is about learning from the past, what worked and what didn’t. It’s also about learning from the actions and beliefs of those who shaped the future by influencing the past. Rauchway provides valuable insights into the minds and motivations of Herbert Hoover and Franklin Roosevelt and, in so doing, offers a valuable contribution to American political science that is well worth reading.